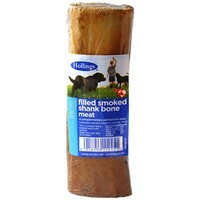 Hollings Filled Bone Treat is a 100% natural high quality air dried dog treat. This smoked shank beef bone is a natural bone product and could splinter. Please supervise your dog.